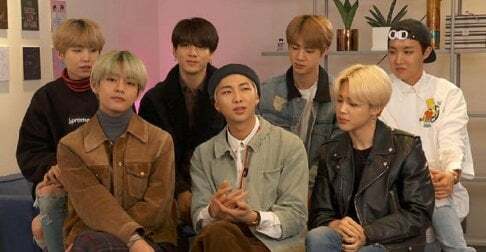 On April 12, BTS guested on 'Morning Mash Up on SiriusXM Hits 1' in light of their new album 'Map of the Soul: Persona.' RM pointed out this is BTS' first interview since the album release. The boys also elaborated on how they came to collaborate with Halsey. RM explained they first met one another at the 'Billboard Music Awards' and knew "Boy With Luv" will be perfect for her as soon as they heard it. Next, BTS talked about their global fame and making history as the first Asian artist to make it in the United States. RM commented, "We've been learning and we know that music truly transcends language. So, you know, we're just grateful for all the ARMYs that they prove us and they prove the world that truly music is over the language barrier." When asked what they want to do in New York City, SUGA shared he already ate The Halal Guys and RM expressed the wish to visit MOMA again. You can view photos of BTS at SiriusXM below! They really made our boys feel comfortable and I can see that they enjoyed a lot! So happy for them! They even gave churros upon our suggestion!